There have been plenty of memorable moments throughout Dwyane Wade's career. 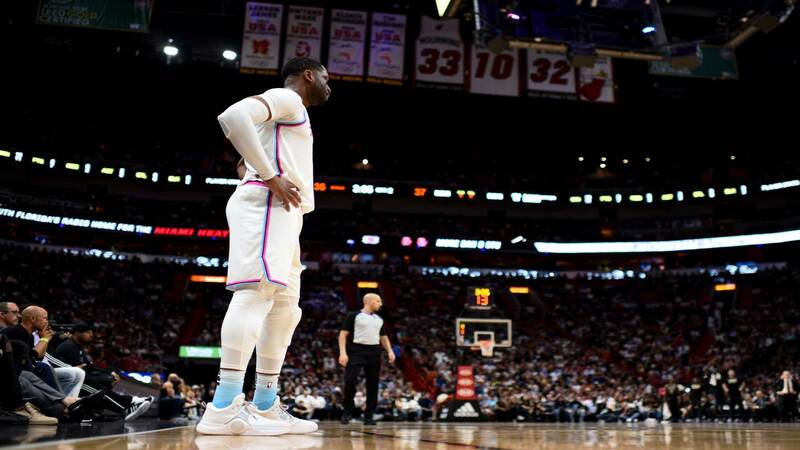 MIAMI - As Dwyane Wade prepares to suit up one last time for the Miami Heat, Local10.com takes a look back at 10 career-defining moments throughout his 16 NBA seasons, 14 of which were spent in South Florida. 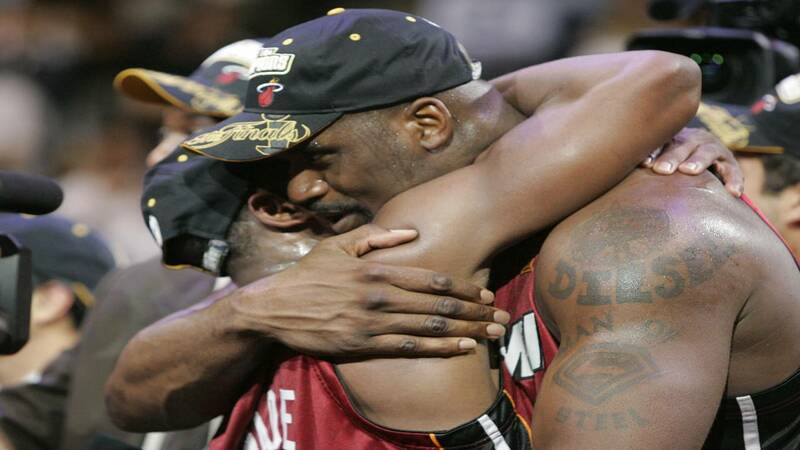 Miami Heat teammates Shaquille O'Neal and Dwyane Wade embrace after beating the Dallas Mavericks 95-92 in Game 6 of the NBA Finals in Dallas, June 20, 2006. The 2006 NBA Finals MVP helped bring a championship to Miami for the first time. Against the Dallas Mavericks, the Heat were trailing the series 0-2 when Wade scored 42, 36 and 43 points, respectively, in the next three games to give Miami a 3-2 lead. The Heat went on to beat Dallas 95-92 in Game 6 behind Wade's 36 points. 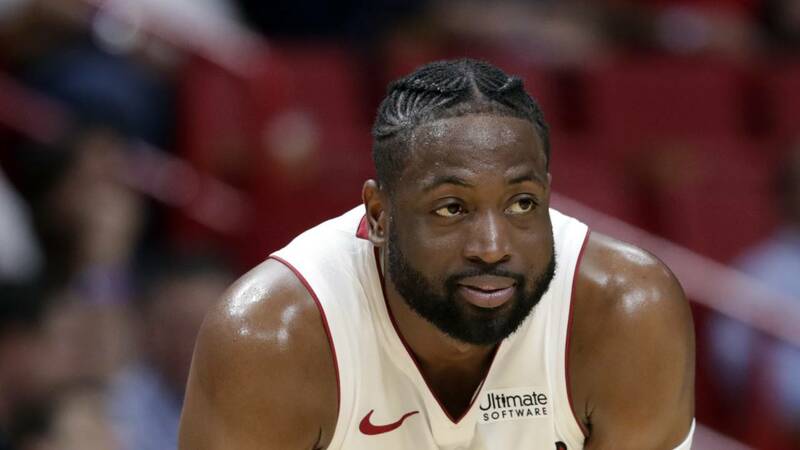 It was an impressive series performance for the then-24-year-old Wade, whose breakout moment came in Game 3, when Wade scored 12 points in the final seven minutes to rally the Heat from a 13-point fourth-quarter deficit. After an 11-10 start to the season, head coach Stan Van Gundy resigned and team president Pat Riley returned to coaching, leading the Heat to 52 wins and a postseason run that included taking down the Chicago Bulls in six games, the New Jersey Nets in five games and the Detroit Pistons in six games. Wade became the fifth-youngest player in league history to be named NBA Finals MVP. Dwyane Wade, LeBron James and Chris Bosh celebrate after beating the San Antonio Spurs in the NBA Finals, June 20, 2013, in Miami. The Heat won their second straight championship. 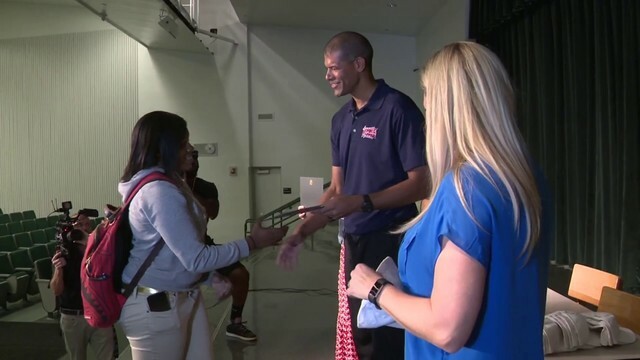 Seven years to the day after winning their first NBA championship, the Heat won their most recent in 2013, defeating the San Antonio Spurs in the last year of the 2-3-2 series format. 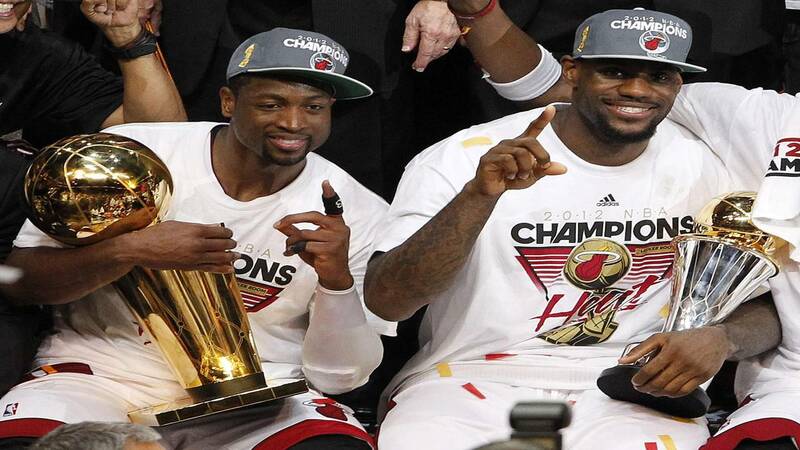 It was Wade's third championship and second straight for the Heat, who were playing in their third consecutive NBA Finals with Wade, LeBron James and Chris Bosh in the lineup. The Heat had won an NBA-best 66 games headed into the playoffs and returned to the Finals after sweeping the Milwaukee Bucks in four games, eliminating the Bulls in five games and taking down the Indiana Pacers in seven games. Nagging injuries limited Wade to a career-low scoring average of 15.9 points per game in the playoffs, but he upped his average to 19.6 in the Finals against San Antonio. The Heat overcame a 3-2 series deficit to beat the Spurs in the final two games at home. Wade scored 14 points in Miami's 103-100 overtime win in the penultimate game and contributed 23 points, along with 10 rebounds, in the Heat's 95-88 win in Game 7. Wade was one of four NBA Finals MVPs to play in the series, along with James and San Antonio's Tim Duncan and Tony Parker. 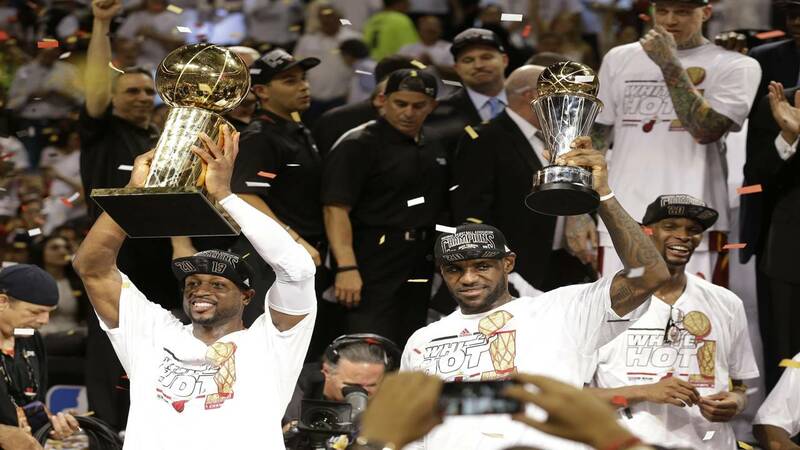 Dwyane Wade holds the Larry O'Brien championship trophy and LeBron James holds his MVP trophy after beating the Oklahoma City Thunder in the NBA Finals, June 21, 2012, in Miami. Wade was finally an NBA champion again. After losing to the Dallas Mavericks in the 2011 NBA Finals, the Heat wouldn't be denied in their second Finals appearance of the "big three" era. Behind Wade, James and Bosh, the Heat won 46 regular-season games and took down the New York Knicks in five games, Indiana in six games and the Boston Celtics in seven games on their way to the 2012 NBA Finals. 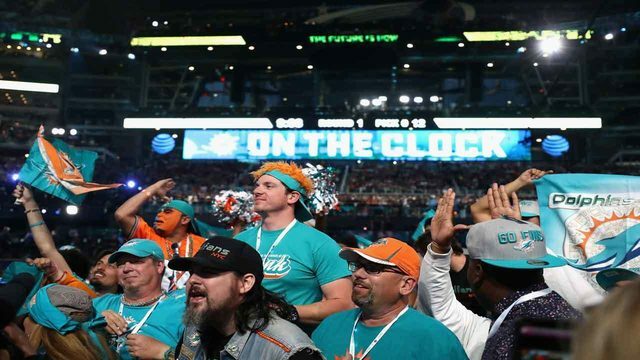 Miami had its most-dominant Finals victory against the Oklahoma City Thunder, winning four straight after losing the first game of the series. In the final game, the Thunder were outscored 36-22 in the third quarter and trailed by as much as 27 at one point. Even though James was named NBA Finals MVP this time, Wade averaged 22.6 points per game in the series. 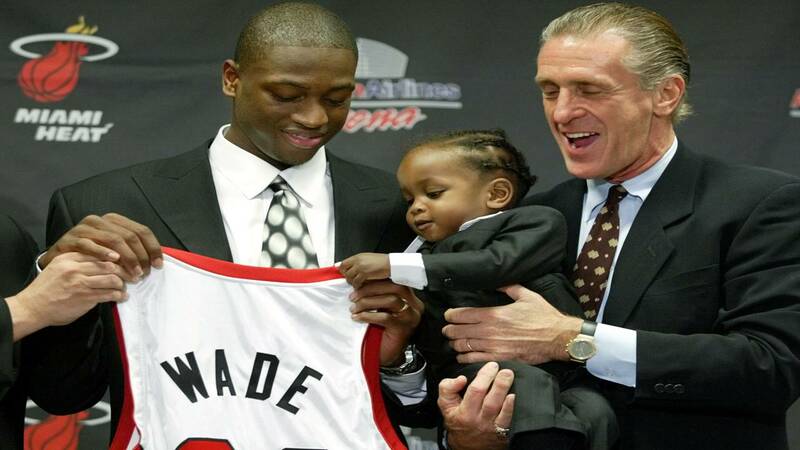 Dwyane Wade, the fifth overall selection in the 2003 NBA draft, and his 16-month-old son, Zaire, are introduced to the media, June 27, 2003, in Miami. Without this seminal moment in Heat history, no other involving No. 6 would have been possible. Wade was the fifth overall pick in the 2003 NBA draft. The first-team All-American at Marquette led the Golden Eagles to the Final Four months earlier, elevating his profile leading up to the draft. Two of the four players picked ahead of him on draft night were James and Bosh. As a rookie, Wade averaged 16.2 points per game and helped the Heat rebound from a 5-15 start to finish 42-40 and qualify for the playoffs. Miami's Dwyane Wade follows through on a last-second shot in double overtime to defeat the Chicago Bulls, March 9, 2009, in Miami. The Heat won 130-127. Wade, who grew up in Chicago, was facing his hometown team in Miami when he had one of his most memorable performances in a Heat uniform. 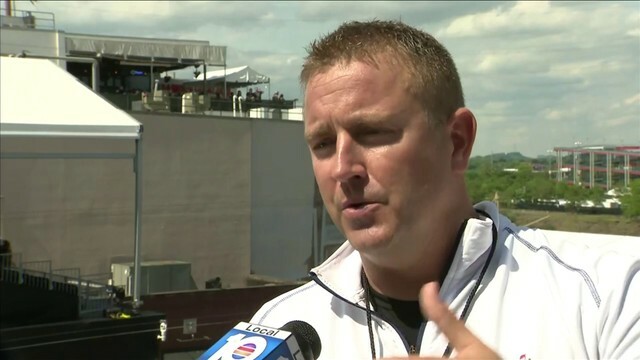 With the score tied in double overtime, Wade stole the basketball from Chicago's John Salmons and hit a three-point shot as time expired to give the Heat a 130-127 victory. He then ran to the scorer's table, jumped on it and, facing the home crowd, yelled, "This is my house!" Wade finished the game with 48 points, six rebounds, 12 assists, four steals and three blocked shots. Miami's Dwyane Wade celebrates after making a 3-point basket against the Charlotte Hornets during the second half in Game 6 of the first-round playoff series in Charlotte, N.C., April 29, 2016. The Heat won 97-90. 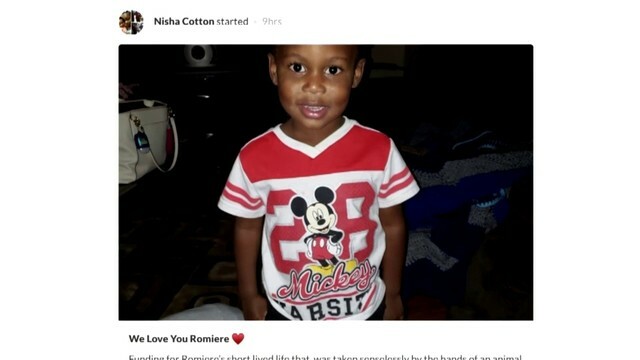 Wade wasn't just going against the Charlotte Hornets in the first round of the 2016 NBA playoffs. He also had to overcome sideline banter from a Charlotte fan forever more known as the "Purple Shirt Man." 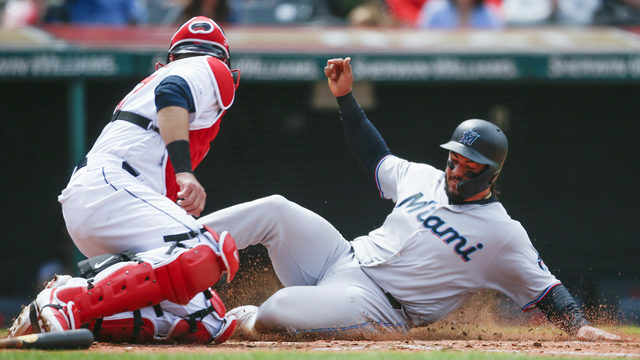 Miami was facing elimination in Game 6 of the opening-round series. 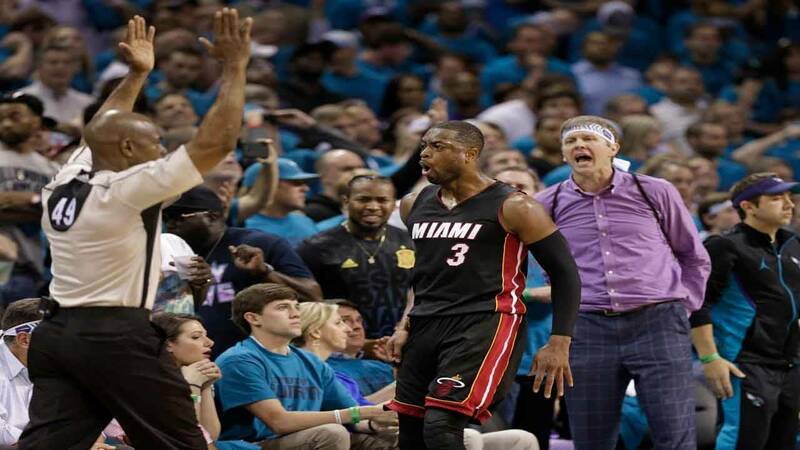 The heckling Hornets fan, wearing a long-sleeve purple button-up shirt, was standing on the sideline throughout much of the fourth quarter, pointing at Wade and telling him to retire. Instead, Wade scored 10 of 23 points in the final quarter, helping the Heat stave off elimination with a 97-90 win. The Heat returned to Miami for Game 7, routing the Hornets 106-73. Charlotte's season was over. Miami's wasn't. 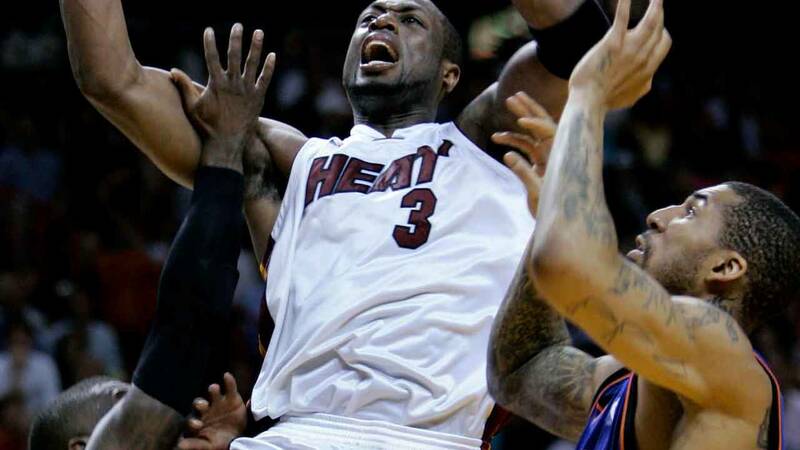 Miami Heat guard Dwyane Wade scored a career-high 55 points against the New York Knicks, April 12, 2009, in Miami. The Heat defeated the Knicks 122-105. The most points Wade ever scored came at home against the Knicks near the end of the 2008-09 season. Wade scored a career-high 55 points, shooting 19-of-30 from the field and 6-of-12 from long range, on the way to a 122-105 win. By the end of the third quarter, Wade already had 50 points. The rest of the Heat had 47. His 55 points were one shy of the franchise record set by Glen Rice. 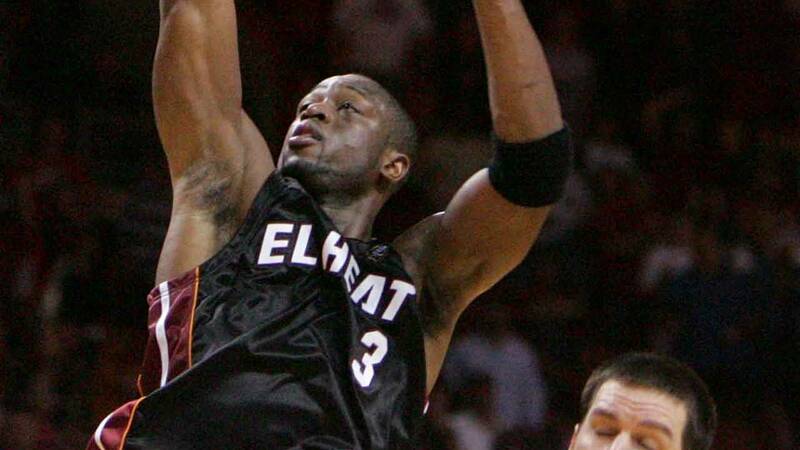 Wade went on to win the scoring title that season, averaging 30.2 points per game. Miami's Dwyane Wade looks on during the first half of the game against the Milwaukee Bucks at American Airlines Arena on Feb. 9, 2018 in Miami. It was Wade's first game back with the Heat after being traded from Cleveland. After spending the 2016-17 season in Chicago and beginning the 2017-18 season reunited with James in Cleveland, Wade returned to Miami in a trade-deadline deal that gave the Cavaliers a heavily protected second-round draft pick. In his first game back with the Heat the next day, Wade received a standing ovation from the home crowd and came off the bench against the Milwaukee Bucks to score three points and record a crucial block in a 91-85 victory. 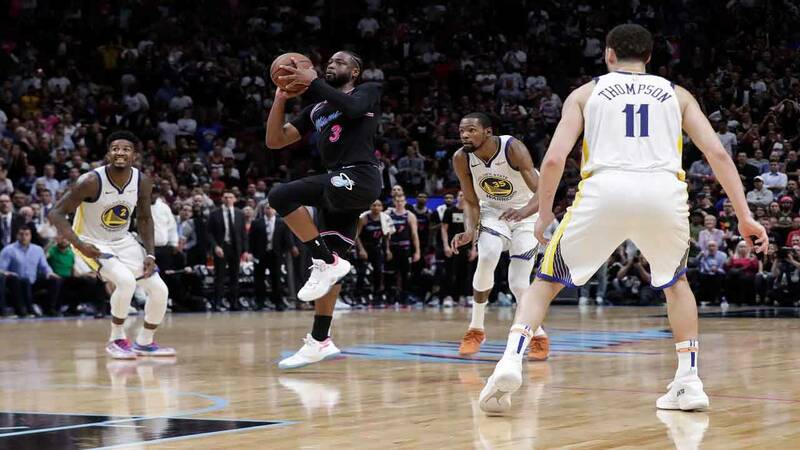 Miami Heat guard Dwyane Wade shoots a 3-pointer at the buzzer against the Golden State Warriors, Feb. 27, 2019, in Miami. The Heat won 126-125. Playing his final season before retirement, Wade showed the NBA's best team that he's still a threat. Wade's 3-point shot with 15 seconds gave Miami a 124-123 lead, but the Golden State Warriors retook the lead. Once again, Wade delivered, hitting a buzzer-beating 3-pointer off the glass as time expired for a 126-125 win. The 37-year-old finished with 25 points and seven rebounds. Dwyane Wade spreads his arms as he arrives in Opa-locka, Florida, Aug. 25, 2008, after a flight home from the Olympics in Beijing. Wade won the medal as a member of the U.S. men's basketball team. OK, so it's not technically a Heat moment, but it was for America. 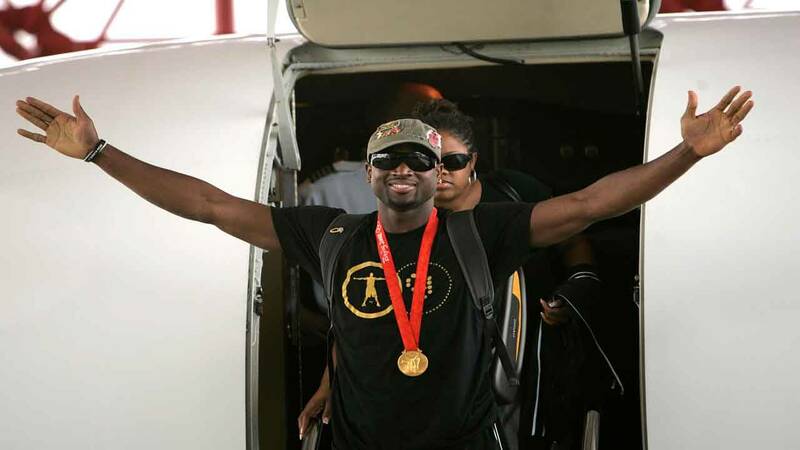 Wade helped the U.S. men's basketball team win the gold medal in the 2008 Olympics in Beijing. He led the team in scoring throughout the tournament and tallied a game-high 27 points in the championship game against Spain.